We are excited to be using a new Science resource together with our existing Foss Kits this year. Cambridge Primary Science is a flexible, engaging course written specifically for the Cambridge Primary Science curriculum framework. 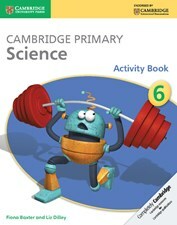 This Activity Book for Stage 6 contains exercises to support each topic in the Learner's Book, which may be completed in class or set as homework. Exercises are designed to consolidate understanding, develop application of knowledge in new situations, and develop Scientific Enquiry and literacy skills. This week we will continue with our unit on Forces and Motion. Homework - Review the work done in class and complete any exercises assigned by your teacher. How does grain size affect dissolving? Complete your Science Fair project - all projects due on 22 May! How can we make solids dissolve faster? Work on your Science Fair project - all projects due on 22 May! Remember the Science Fair 'materials and procedure' are due on Thursday! Remember the Science Fair hypothesis is due on Thursday! Students will also receive important information about the Science Fair that will take place on 23 May. Remember the Science Fair proposal is due on Wednesday! No Science this week due to rehearsals for the Musical. Homework - Review the work done in class and complete any exercises as assigned by your teacher. This week we will continue learning more about our final body organ for this unit - The Brain! This week we will continue learning more about the urinary system and the kidneys. We will also introduce our final body organ for this unit - The Brain! This week we will continue learning more about the respiratory system and introduce the urinary system. This week we will complete our investigation of the circulatory system by integrating it with Math. We will collect data about our heart rate and pulse and present the information using various charts and graphs. We will also introduce the next body system - the respiratory system. This week we focus on the heart, heartbeat and pulse. Last week, we focused on the digestive system and on Wednesday there will be a quiz about all the work we have done so far related to the topic. This week our focus shifts to the heart, heartbeat and pulse. Homework - Review for the quiz on Wednesday. Use class notes, graphic organizers, the student textbook and activity book to review for the quiz. Homework - Review the work from UNIT 5 for a Science test on Wednesday 25 January. This week we will review our unit on electricity with the aim to prepare for an end-of-unit assessment next week. This week we will finish with our unit on electricity. We will do some investigations in class and discuss how scientists invented batteries. Homework - Exercise 5.6 in the Science Activity Book. adding different components to the circuit. Complete any unfinished class work at home and review the work done in class. This week we will continue with investigations and written activities related to electricity. Do different metals conduct electricity equally well? This week we will work on our in-class, mini project that is due on Thursday. Please read the project instructions carefully. Students must bring all their research and images / pictures to school on Tuesday so that we can start work on our projects. Find the project instructions here. This week we will continue to investigate and discuss the negative impact that deforestation, air pollution and acid rain have on the environment. We will also look at how we can look after the environment, with focus on the 3 Rs - Reduce. Reuse. Recycle! Students will receive information during the course of the week regarding an in-class, mini project about our current Science Topics. Find the project instructions here. This week we will investigate and discuss the negative impact that deforestation, air pollution and acid rain have on the environment. Students will observe and record findings regarding their mini investigation to show that plants need water and sunlight. We will also use the FOSS Science kits this week to complete hands-on activities regarding food chains and food webs. Students explore and can construct food chains in a particular habitat. Students will investigate food chains in a local habitat and will learn that food chains begin with plants. ​This week learners will work in groups to plan and carry out an investigation to show that plants need water and sunlight.